It is fatal, however, to abandon and lose sight of one's own principles in the quest for allies in specific tactical actions. Anarcho-communism, both in its original Bakunin-Kropotkin form and its current irrationalist and "post-scarcity" variety, is poles apart from genuine libertarian principle. Furthermore, scorning and detesting the free-market, the profit-and-loss economy, private property, and material affluence — all of which are corollaries of each other — anarcho-communists wrongly identify anarchism with communal living, with tribal sharing, and with other aspects of our emerging drug-rock "youth culture." Philosophically, this creed is an all-out assault on individuality and on reason. The individual's desire for private property, his drive to better himself, to specialize, to accumulate profits and income, are reviled by all branches of communism. Instead, everyone is supposed to live in communes, sharing all his meager possessions with his fellows, and each being careful not to advance beyond his communal brothers. At the root of all forms of communism, compulsory or voluntary, lies a profound hatred of individual excellence, a denial of the natural or intellectual superiority of some men over others, and a desire to tear down every individual to the level of a communal ant-heap. In the name of a phony "humanism", an irrational and profoundly anti-human egalitarianism is to rob every individual of his specific and precious humanity. Furthermore, anarcho-communism scorns reason, and its corollaries long-range purpose, forethought, hard work, and individual achievement; instead, it exalts irrational feelings, whim, and caprice — all this in the name of "freedom". The "freedom" of the anarcho-communist has nothing to do with the genuine libertarian absence of interpersonal invasion or molestation; it is, instead, a "freedom" that means enslavement to unreason, to unexamined whim, and to childish caprice. 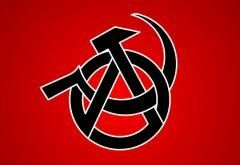 Socially and philosophically, anarcho-communism is a misfortune. Economically, anarcho-communism is an absurdity. The anarcho-communist seeks to abolish money, prices, and employment, and proposes to conduct a modern economy purely by the automatic registry of "needs" in some central data bank. No one who has the slightest understanding of economics can trifle with this theory for a single second. Fifty years ago, Ludwig von Mises exposed the total inability of a planned, moneyless economy to operate above the most primitive level. For he showed that money-prices are indispensable for the rational allocation of all of our scarce resources — labor, land, and capital goods — to the fields and the areas where they are most desired by the consumers and where they could operate with greatest efficiency. The socialists conceded the correctness of Mises's challenge, and set about — in vain — to find a way to have a rational, market price system within the context of a socialist planned economy. The Russians, after trying an approach to the communist moneyless economy in their "War Communism" shortly after the Bolshevik Revolution, reacted in horror as they saw the Russian economy heading to disaster. Even Stalin never tried to revive it, and since World War II the East European countries have seen a total abandonment of this communist ideal and a rapid move toward free markets, a free price system, profit-and-loss tests, and a promotion of consumer affluence. It is no accident that it was precisely the economists in the Communist countries who led the rush away from communism, socialism, and central planning, and toward free markets. It is no crime to be ignorant of economics, which is, after all, a specialized discipline and one that most people consider to be a "dismal science." But it is totally irresponsible to have a loud and vociferous opinion on economic subjects while remaining in this state of ignorance. Yet this sort of aggressive ignorance is inherent in the creed of anarcho-communism. The same comment can be made on the widespread belief, held by many New Leftists and by all anarcho-communists, that there is no longer need to worry about economics or production because we are supposedly living in a "post-scarcity" world, where such problems do not arise. But while our condition of scarcity is clearly superior to that of the cave-man, we are still living in a world of pervasive economic scarcity. How will we know when the world has achieved "post-scarcity"? Simply, when all the goods and services that we may want have become so superabundant that their prices have fallen to zero; in short, when we can acquire all goods and services as in a Garden of Eden — without effort, without work, without using any scarce resources. The fact that the abandonment of rationality and economics in behalf of "freedom" and whim will lead to the scrapping of modern production and civilization and return us to barbarism does not faze our anarcho-communists and other exponents of the new "counter-culture." But what they do not seem to realize is that the result of this return to primitivism would be starvation and death for nearly all of mankind and a grinding subsistence for the ones remaining. In the disturbances caused by scarcity of food, the mob goes in search of bread, and the means it employs is generally to wreck the bakeries. This may serve as a symbol of the attitude adopted, on a greater and more complicated scale, by the masses of today towards the civilization by which they are supported … Civilization is not "just here," it is not self-supporting.